Lot # 120: 1938 Goudey “Heads-Up” #270 Ernie Lombardi (PSA NM/MT+ 8.5) - “1 of 2” & HIGHEST GRADED Example! 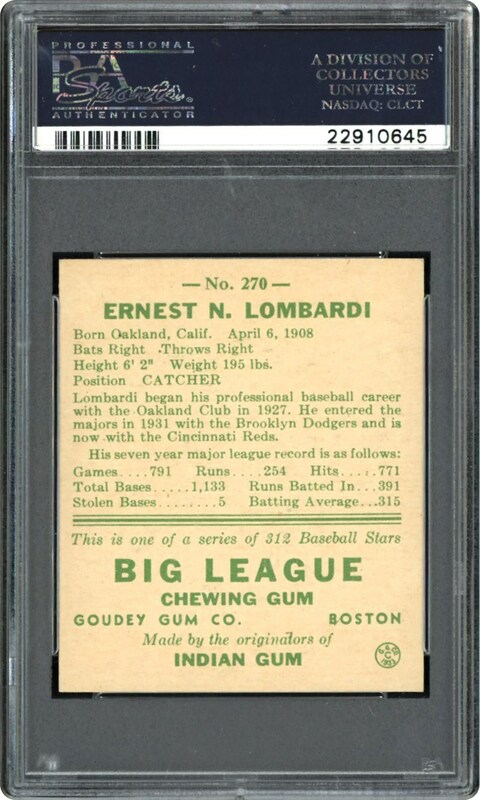 1938 Goudey "Heads-Up" #270 Ernie Lombardi (PSA NM/MT+ 8.5) - "1 of 2" & HIGHEST GRADED Example! Any "1 of 2" highest graded 1938 Goudey "Heads-Up" subject merits serious attention, let alone one of the highly coveted Hall of Famers in this illustrious set. That said, we are proud to present this PSA NM/MT+ 8.5 Ernie Lombardi marvel that shares the distinction with only a single other copy as the pinnacle example on the planet! Hall of Famer Ernie Lombardi arguably had the largest hands imaginable, with this standout catcher also noted for his extremely lethargic feet. True, Lombardi was one of our National Pastime's greatest catchers ever, but he was so slow a foot that it was said: "he could turn doubles into singles"! Synonymous with his superior catching skills and "mitt sized" hands is this premier offering that has bested virtually all of its peers. Rightfully earning the stratospheric 8.5 assessment, its classic Lombardi catching pose exhibits extremely vibrant hues and of great significance, possibly the finest centering you will ever see on ANY 1938 Goudey subject. 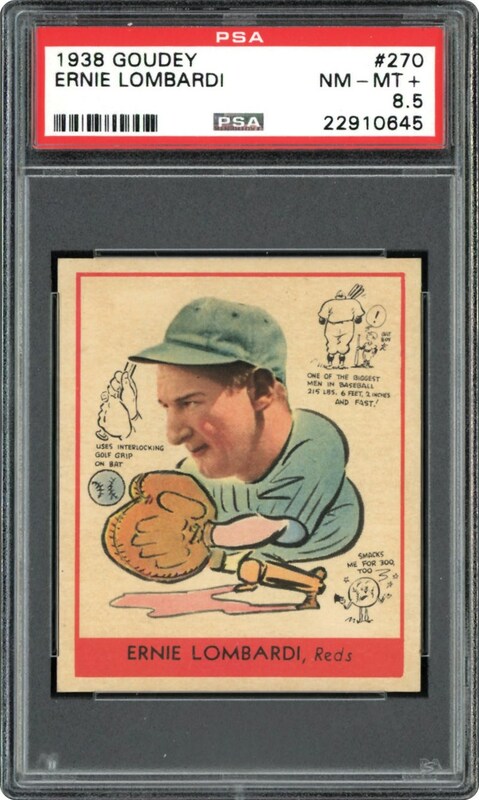 One of the most momentous 1938 Goudey subjects extant via its "1 of 2 - best of the rest" standing, it merits a final resting place in one of the finest PSA Registered '38 Goudey compilations!